Born April 13, 1935 in Okinawa. Yogi Sensei, 8th dan Kobudo is executive advisor for the Okinawa Kobudo Doushi Rensei-kai. 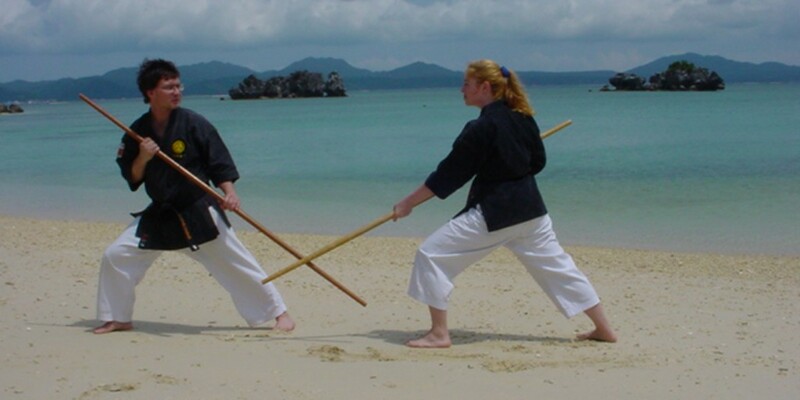 A very prominent Karate and Kobudo instructor on Okinawa. Yogi Sensei also holds the rank of 9th dan in Konan-ryu Karate-do. He is famous for his patient teaching methods and opens his heart to every student. It is truly a pleasure to experience Yogi Sensei’s philosophy of life. Yogi Sensei exemplifies the true spirit of Karate-do and Kobudo. Matayoshi Shinko Sensei or “Kama nu Matehi” (Matayoshi the Kama) as he was often called, was born in the city of Naha, Okinawa in 1888. As the third son of Matayoshi Shinchin, a wealthy businessman, Shinko was the only member of the family to become involved in the martial arts. Although Matayoshi Shinko, Sensei grew up predominantly in Okinawa, he traveled later on in his life around different areas of Japan and China. It was in Okinawa, Hokkaido, and China that Matayoshi Shinko Sensei received the majority of his exposure and training in various weapon arts. Matayoshi Shinko Sensei would later incorporate many of the weapons and styles of his instructors to form the foundation of what we know today as Matayoshi Kobudo system. Matayoshi Shinko Sensei had the opportunity to experience the art of weapons from many different instructors. During his teens, Matayoshi began his training in kobujutsu, under the instruction of Agena Chokuho Sensei of Gushikawa Village. From Agena Sensei, Matayoshi learned Bo-jutsu, Sai-jutsu, Kama-jutsu, and leku-jutsu. Matayoshi Shinko Sensei then became the student of Irei Sensei of Nozato, Chatan Town, from whom he learned the arts of Tonkua-jutsu and Nunchaku-jutsu. Not long after, at the age of 22, Matayoshi Shinko Sensei left on an adventure to Manchuria where he joined a mounted nomadic tribe, from whom he gained exposure in the arts of Ba-jutsu (bow and arrow while riding a horse), Shuriken-jutsu, and Nagenawa-jutsu (rope throwing). Shinko Sensei continued in his travels to expand his knowledge of the art of weaponry, arriving in Shanghai where he learned the arts of Nunti-jutsu, Tinbei-jutsu, and Suruchin-jutsu. while in Shanghai, he began to develop interests outside of kobudo, yet still within the realm of the martial arts. Matayoshi Shinko Sensei became involved in the study of Chinese acupuncture and herbal medicine under the instruction of Kinkoroushi. He furthered his studies in China, learning Chinese boxing and Shorinji-Kempo in Fuchow, China. Because of his abilities and knowledge, windows of opportunity were opened to Matayoshi Shinko Sensei, and he was able to participate in two very notable moments in the history of the martial arts. In 1915, during the Imperial Memorial Budo Demonstration Festival at the Meiji Shrine in Tokyo, Shinko Sensei demonstrated Tonkua-jutsu and Kama-jutsu, while Funakoshi Gichin Sensei (the founder of Shotokan) demonstrated karate. This was the first time that Okinawan Kobudo was publicly demonstrated in mainland Japan, and remains a very important event in the history of Kobudo. Later, in 1921, during the honorable visit of Prince Hirohito (Showa) to Okinawa, Matayoshi Sensei demonstrated Kobudo, and Miyagi Chojun Sensei (the founder of Goju Ryu) demonstrated Karate for the distinguished guest. It was not until 1935 when Matayoshi Shinko Sensei returned to Okinawa, settled in the city of Naha, and shaped his experiences to the point of developing the Matayoshi style of Kobudo. Matayoshi Shinko Sensei passed away in 1947 at the age of 59. Matayoshi Shinpo Sensei, son of Matayoshi Shinko Sensei and successor to the Matayoshi line of Kobudo, was born in Okinawa in Yomitan Village, located in the Kina District on December 27, 1921. Shinpo Sensei was introduced to the martial arts by his father at the very young age of 6. However, Matayoshi Shinko Sensei did not limit his son to the practice of Kobudo; he also exposed Shinpo Sensei to Kingai Ryu, a White Crane open hand system. In 1937, Shinpo Sensei’s father also introduced him to the open hand system of Hakaku Kempo, which he learned from Gokenki Sensei. Although Shinpo Sensei would have various instructors throughout his life, his father remained his life-long instructor and mentor. Matayoshi Shinpo Sensei remained in Okinawa until 1938, when he moved to Kawasaki-Shi in Kanagawa-Ken. He spent 19 years in the city of Kawasaki teaching and training. The year 1957 brought Shinpo Sensei back to Okinawa, where he taught kobudo predominantly in Goju Ryu dojos, namely that of Higa Sensei. While teaching kobudo in various karate dojos, Matayoshi Sensei realized that karate was growing in popularity, where as kobudo was not. Matayoshi Sensei wanted to increase the exposure of kobudo among the people of Okinawa, so he decided to form his own dojo. Once Matayoshi Sensei opened his dojo, he focused on contacting Kobudo instructors and students all over Japan. His intention was to unite Kobudo practitioners under one goal; to not only to spread the art of Kobudo, but also to try to maintain the traditions that had been passed down from Kobudo Senseis of earlier days. Matayoshi Sensei had a strong interest in promoting Kobudo among young students to help make them better citizens and contributors to society. As a result of this interest, Matayoshi Sensei formed the Ryukyu Kobudo Association in 1960. This association became the foundation of the Zen Okinawa Renmei or All Okinawa Kobudo League, which formed in 1972 and still exists today. Matayoshi Shinpo Sensei appointed Gakiya Yoshiaki as head of the system before he died. Matayoshi Sensei passed away in Okinawa on September 7, 1997, at the age of 76. Matayoshi Sensei was the Representive for the DNBK up to the time of his death. Gakiya Yoshiaki was born in Showa 25 (1950), in Yomitan village in Okinawa prefecture. In 1967 he began studying Goju-ryu Karate under Fukichi Seiko, and in 1980 he began studying Shorin-ryu Karate under Nakamura Yoshio. In 1975 he joined the All Okinawa Kobudo Association, entering it’s main dojo, the Kodokan, and training under Matayoshi Shinpo Sensei. He became Matayoshi Sensei’s right hand man, and worked diligently as the main instructor at the Kodokan Dojo and traveling around Japan and overseas in an effort to teach and popularize the art of Kobudo. In 1997, after Matayoshi Sensei passed away, he was appointed the second Kancho (president) of the Kodokan Dojo, and as successor continued to work for it’s expansion and development. After 5 years, he respectfully resigned his position at the Kodokan. In January of Heisei 14 (2002), he founded the Okinawa Kobudo Doushi Rensei-kai. He built the Renshikan Dojo as a place where kindred spirits in the study of Okinawa Kobudo could come to train hard and polish their character. Gakiya Sensei is currently working on developing the organization and expanding it’s worldwide membership. He appointed Neil Stolsmark of Waukesha, Wisconsin USA as the Chiku Honbu-cho (Regional Chairman) of North America for the Okinawa Kobudo Doushi Rensei-kai. Sensei Mike and Laura Sywyk are direct students of Sensei Neil Stolsmark and the olny students of Sensei Stolsmark in Canada. Sensei Mike and Sensei Laura also train with Gakiya Sensei and Yogi Sensei when they travel to Okinawa. Appointed International President of the OKDR in May of 2012, Kyoshi Stolsmark is Sensei Mike and Senei Laura’s kobudo teacher. He has been actively training in the Martial Arts for over 35 years. He has been a full time Karate instructor since 1983. Called the “Instructor of the Instructors”, he has an insightful, precise teaching style rarely seen in martial arts training. Many of his students include qualified martial artists and Karate studioowners. He inspires both young and old and his enthusiasm is contagious. In his search for knowledge, he has traveled extensively in the United States, Canada, Europe, Australia, Japan and Okinawa, having the good fortune to be exposed to many Karate styles and master instructors. He is one of 18 people outside of Okinawa to represent 10th dan Shorinkan Grandmaster Shugoro Nakazato as a conferred instructor (Kyoshi 8th Dan) of Karate-do. His Kobudo teacher is 8th dan Sensei Yoshiaki Gakiya of Okinawa.